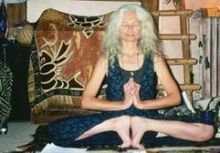 Jeannine Parvati (June 1, 1949 – December 1, 2005) was an anti-circumcision activist, yoga teacher, midwife and author. Parvati's first book, Prenatal Yoga & Natural Childbirth, was influenced by ashtanga yogi Baba Hari Dass. Her second, Hygieia: A Woman's Herbal was her master's thesis in psychology at San Francisco State University. Later she co-authored, with her second husband and under the last name Parvati-Baker, Conscious Conception: Elemental Journey through the Labyrinth of Sexuality. Parvati practiced as a midwife in Sonoma County, California for over ten years, before moving to rural southern Utah where she continued her practice and taught Prenatal Yoga while raising a family. She founded Hygieia College, a mentorship program. She is credited with popularizing the practice of lotus birth in the United States. As a keynote speaker at conferences on genital integrity, Parvati was an advocate for eradicating circumcision. She also authored "The Wound Reveals The Cure: A Utah Model For Ending The Cycle of Sexual Mutilation". Parvati died at home December 1, 2005, aged 56, after a two-year battle with Hepatitis C in Utah. Parvati, Jeannine (2001). Prenatal Yoga and Natural Childbirth. North Atlantic Books-Consumer Hlth; 2nd edition. ISBN 1-55643-382-4. Parvati Baker, Jeannine (1986). Conscious Conception: Elemental Journey Through the Labyrinth of Sexuality. North Atlantic Books. ISBN 0-938190-83-0. Parvati, Jeannine (1979). Hygieia: A Woman's Herbal. Freestone Publishing Company. ISBN 0-913512-54-0. Various Articles and Book Reviews by Jeannine Parvati on Midwifery & Parenting topics catalogued on the Assn. of Pre & Perinatal Health's webpage. ^ Senepathy, Kavin (2018). "Lotus Birth". Skeptical Inquirer. 42 (4): 44–46. ^ THE WOUND REVEALS THE CURE: A UTAH MODEL FOR ENDING THE CYCLE OF SEXUAL MUTILATION by Jeannine Parvati Baker, Presented at the Fourth International Symposium on Sexual Mutilations, University of Lausanne, Lausanne, Switzerland, August 9–11, 1996. ^ published in Sexual Mutilations: A Human Tragedy, New York: Plenum Press, 1997 (ISBN 0-306-45589-7).